The pages shown are taken from the diaries of Dr Thomas Lucas, surgeon in Stirling. The Archive holds two of Dr Lucas’s diaries, and also a Memorandum Book. 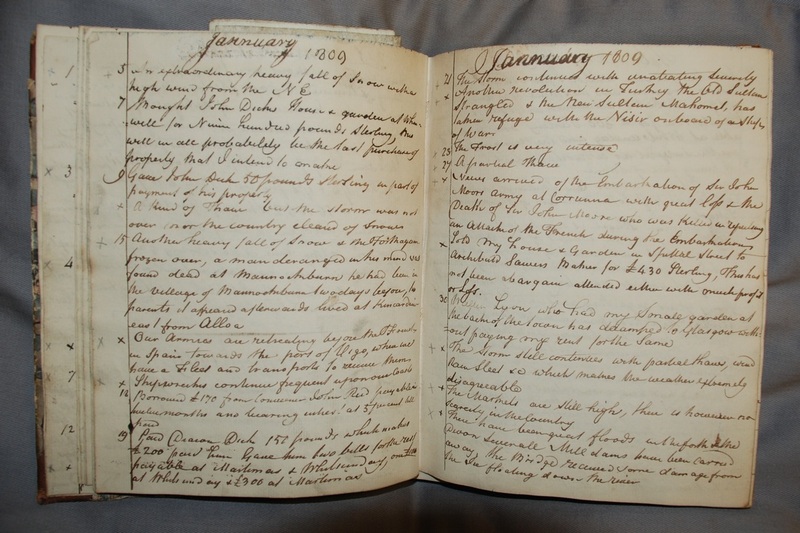 The diaries contain everything from day to day news in the town, to comments on Dr Lucas’s friends, family and business acquaintances, to international affairs and even the state of the weather. Written before the first local newspapers are available for Stirling (the Stirling Journal began in 1820), these diaries afford us a fascinating view of Georgian Stirling as seen through the eyes of a local eminent surgeon and businessman, whose lively interest in the world around him is evidenced by the range of topics recorded. Our Armies are retreating before the French in Spain towards the port of Vigo, where we have a Fleet and transports to receive them. Shipwrecks continue frequent upon our Coasts. 21st The Storm continues with unabating Severity. Another revolution in Turkey the Old Sultan Strangled & the New Sultan Mahomet, has taken refuge with the Nisir onboard of a Ship of War. 27th News arrived of the Embarkation of Sir John Moors Army at Corrunna with great loss & the Death of Sir John Moore who was Killed in reputing an Attack of the French during the Embarkation. Sold my house & Garden in Spittal Street to Archibald Sawers Baker for £430 Sterling, This has not been a bargain attended either with much profit or Loss. 30th Walter Lyon who had my Small garden at the back of the town has decamped to Glasgow without paying my rent for the same.